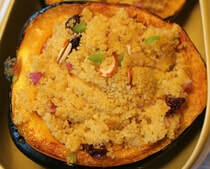 Acorn Squash Stuffed with couscous makes festive looking side dish. Couscous is a quick cooking pasta. This is even quicker because it's cooked in the microwave. A fresh and easy side dish. Wine adds a nice flavor but if you concerned about the alcohol content you can use chicken broth instead. This couscous makes a fabulous stuffing. 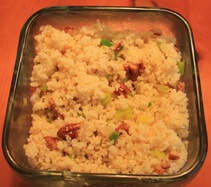 Savory vegetables and couscous are a lovely accompaniment for chicken, pork or steak entrees. With its beautiful golden color, this couscous is both a treat for the eye as well as the taste buds. Follow any of the methods of roasting garlic in Becky's Tips. This is a simple recipe that goes with just about anything. Roasting the vegetables adds such great flavor and color.